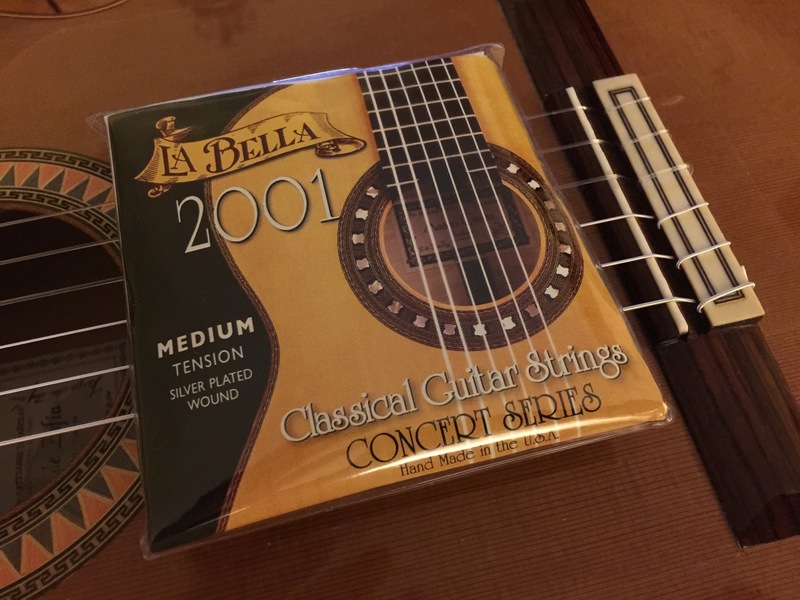 Two days ago I put on a set of La Bella 2001 Medium tension strings. The set has 78.32lbs tension, much less than Daddario EJ45,EJ45C,EJ25C or EJ25B whic is what I have been using for years. I have to say they were quick to be able to play and stay in tune less than an hour break in time. The (G) string really impressed me as it felt good and nice on the fingers. I think the bass strings are silky and smoth with a defined rich tone that keep opening up for a day or two. They feel so good on the fingers. The trebles are very constant from g,b,e and not to bright or metallic in tone yet they do have some sizzle. I’m really liking these so far and will post more in 2-3 weeks. Also worth noting these strings have a online price of 7.00-7.25. There is also a 10 pack set and 3 extra g strings. The strings are 3.00 less than some of the Dadario sets. Piezoelectric transducers are popularly used to “electrify” acoustic instruments, and are increasingly found embedded in the bridge saddles of electric instruments as well. Manufactured transducers or pickups (I use the terms interchangeably) are available from a number of sources. This article provides instructions for making an under saddle piezo pickup for a flat top guitar. These instructions can be followed by anyone with the electronic assembly skills needed to solder a plug on an instrument cable. If you know which end of a soldering iron to grab hold of, you can build this pickup. A short discussion on installation is included, as is information on preamps suitable for the pickup. A schematic for a preamp circuit is provided for the electronically experienced. A piezo transducer is a pickup that uses some sort of piezoelectric material to convert sound (pressure) energy into electrical energy. Simply put, a piezo material is any material that will generate an electrical charge when mechanically deformed. There are four types of piezo materials used in the manufacture of instrument transducers – lead zirconate titanate (PZT) ceramic chips, PZT ceramic bender discs, polyvinylidene fluoride (PVDF) plastic film, and PVDF coaxial (coax) cable. PZT chips find their way into what are now old style under saddle guitar transducers, transducers for various bowed instruments, and manufactured arched top guitar and mandolin bridges. PZT discs consist of PZT material bonded to thin brass disks, and are commonly used for soundboard pickups for flat top guitars and for bridge-mounted pickups for upright basses. PVDF film may be found in all sorts of transducers from under saddle guitar transducers to under-bridge-foot transducers for bass viols. PVDF coax cable is manufactured just like the single conductor shielded cable used to make instrument cables, except that instead of an insulating material between the center conductor and the outer shielding braid, PVDF material is used there. It is used in manufactured under saddle pickups for acoustic guitars and is the material that will be used to construct a transducer in this article. All of these piezo materials have physical and electrical characteristics which make them suitable for extremely high fidelity transducers for musical instruments, a fact which is belied by the rather humble applications to which these materials are often applied. PZT ceramic chips are used to make the igniters for gas barbecue grills and camping lanterns. PZT disks are probably most frequently used as cheap buzzers in electronic devices and as microphones and speakers in telephones. And the piezo coax cable used in the transducer in this article is most often found buried in the road to let automated traffic lights know when a car is approaching. Again, although used for a wide variety of applications, these materials are no less suitable for the high fidelity application of musical instrument pickup. To make a pickup for a musical instrument, two wires are connected to a piezo material. The resulting element is mounted so that sound from the instrument causes the material to deform, producing an electrical signal which varies in proportion to the deforming vibrations. Pickup placement is critical to good sound reproduction and always represents at least one tradeoff. The fact is there is no perfect place to locate a piezo transducer, as all locations color the sound in one way or another. In guitars, piezo transducers are most often located on the underside of the soundboard or in the bridge. Soundboard placement is problematic in that the soundboard vibrates in a modal fashion related to frequency. This means that a transducer mounted on the soundboard will be more sensitive to certain frequencies and less sensitive to others, those frequencies depending on where on the soundboard the transducer is located. Soundboard transducers are also prone to feedback even at low levels of amplification. These days the most popular place to locate a piezo transducer on a guitar is in the bridge, and for flat top guitars the most popular place in the bridge is directly under the saddle. Here, string tension variations caused by the vibration of the string translate into pressure variations on the saddle, which rests right on top of the transducer. This placement is less prone to feedback than soundboard placement and also produces a more balanced frequency spectrum. On the downside, under saddle placement reads more of the sound of the strings themselves, and less of the sound of the entire instrument. Again, there is always a tradeoff with transducer placement, but this is one that works out well in practice. 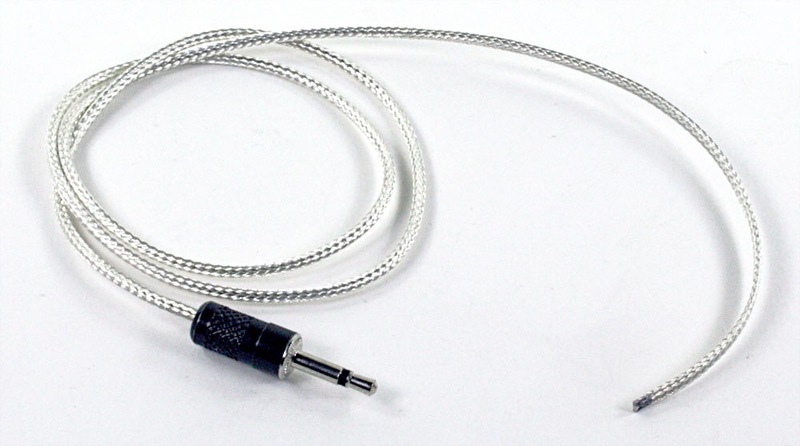 I’ve chosen piezo coax cable for the pickup in this article. Piezo coax cable is probably the easiest material to use without special tools and jigging. All piezo electric materials mentioned present very high electrical impedances and as such must be thoroughly shielded to prevent the pickup of electrical noise and hum. As the piezo coax cable is well shielded as manufactured, no additional effort is necessary to shield the transducer element itself. This material is also very simple to cut– it can be cut to length using wire cutters. Finally, piezo coax cable is very easy to wire up. With the discussion of piezo materials and instrument transducer design and placement accomplished, let’s look at the construction of an under saddle transducer. Approximately 5” of piezo coax cable, approximately 0.125” in diameter (Measurement Specialties Inc. PVDF piezo coax cable or equivalent). Approximately 18” of high Z, shielded, single conductor microphone cable, 0.125” or less in diameter. (Mogami 2368 or equivalent). An assortment of diameters of heat shrink tubing (Radio Shack #910-3388 or equivalent). Copper shielding foil with conductive adhesive (Stewart MacDonald #0028 or equivalent). See the Sources section at the end for information on where to get these supplies. Soldering iron (pencil type, approx. 35W) and solder. 1. Measure the coax carefully. You’ll need enough to fill the length of the under saddle slot, plus enough to go through the bridge into the inside of the instrument, plus another inch. If you are working from a long piece of coax, it is best to leave the piece full length and then cut off the right amount after you’ve wired it. 2. Carefully strip 0.5” of the jacket from both the piezo coax and the shielded cable. When you strip the piezo coax cable, hold the cable firmly with a pair of pliers instead of your hands. The jacket is made of slippery polyethylene and it is easy to yank it right off the entire length of cable (but not so easy to force it back on again). 3. Unbraid the shielding wire just exposed from the piezo coax by picking at it with an awl or other sharp instrument. Pull the shielding back from the coax. Do the same with the shielding exposed on the cable. Photo 1 shows the shielding on the piezo coax unbraided, and the machinist’s scribe I used to do it. 4. Strip 0.25” off the inner insulation of both the piezo coax and the cable. Again, hold the coax firmly with pliers to avoid slipping the inner conductor right out. 5. Cut a 0.75” piece of heat shrink tubing and slip it over the stripped end of the cable. 6. Weave the inner conductors of the piezo coax and the cable together and solder them, using a minimum of solder (see photo 2). 7. Slip the piece of heat shrink tubing over the solder joint, and heat it to shrink (photo 3). 8. Lay the shielding from both the piezo coax and the cable over the joint and lightly weave them together. The idea is to make a good mechanical joint without making a big lump. Tack solder the shielding together, using a minimum of solder. Use a light touch with the soldering iron– it is possible to burn through the heat shrink tubing underneath if the iron is pressed too hard or left too long on the joint. 9. Now that the cables have been electrically connected we need to shield the entire joint just made. This is done by wrapping a small piece of shielding foil with conductive adhesive over the joint. Cut a small piece of shielding foil 0.75” wide by 0.5” long. Remove the backing and wrap the foil around the joint. The idea here is to completely cover the joint with foil, right up to the outer insulation of the two cables. It is better to err on the side of too much foil than too little. If the joint is not completely shielded the finished pickup will have an annoying hum. Photo 4 shows the shielding soldered and the piece of shielding foil in the foreground. 10. Cut a piece of heat shrink tubing 1.25” long, slip it over the cable, and position it to cover the entire joint. Heat to shrink. Photo 5 shows the joint completely covered with the foil and the heat shrink tubing ready to be slipped over the joint and heated and photo 6 shows the completed transducer. 11. If you have not cut the coax to length in step 1, use a wire cutter to do it now. 12. Strip the lead end of the cable and check the completed transducer for shorts using a Volt Ohm Meter. If you do not have one you can simply solder a plug on, plug it into an amp, and whack it. If it makes some sound, then there is no short. If you do find a short it can be in one of two places, the joint between the coax and cable, and the free end of the coax. Check for the latter by examining the end of the coax with a magnifier, using the awl to push any pieces of the shielding that may be in contact with the center conductor. If the end of the coax checks out OK, then the short is in your joint and there is no option but to chop the joint out and try again. 13. Place a drop of cyanoacrylate glue on the free end of the coax. This will fix any free fibers of the shielding braid. The installation of an under saddle piezo transducer is well documented in a number of places. One of the best set of instructions for how to do this appears in Dan Erlewine’s excellent book Guitar Player Repair Guide. I won’t repeat the basics here, but will only detail those instructions that are unique to the installation of under saddle transducers made with piezo coax cable. The major deviation from Erlewine’s instructions involve drilling the hole for the transducer’s wire. When installing a piezo coax transducer the coax itself enters the saddle slot through a hole drilled into the inside of the instrument. Since the coax cable is approximately 0.125” in diameter, a hole of that size must be drilled. Also note that you cannot make a tight bend in the piezo coax – see photo 6 to get an idea just how tight you can bend it. For this reason it is necessary to drill the access hole through the bottom of the saddle slot, guitar top, and bridge plate at an angle. This way the coax does not have to be bent so tightly. Don’t make the angle so severe that the part of the transducer inside the guitar will touch a brace though (and certainly don’t drill through any braces!). Figure 7 shows an end view of the saddle with a cutaway view of the angled access hole. Once the access hole is drilled the transducer is threaded into the saddle slot from the inside of the guitar. You can glue or tape the part of the transducer that is inside the guitar to the underside of the bridge plate to keep it in position if necessary. It is amazing how many manufacturers of piezo pickups claim that their products can be used without preamps. In fact, using any piezo pickup without a preamp is similar to using a car without tires– possible in theory, but hardly practical. Piezo transducers are high impedance devices, and this quality, along with the low impedance of the amp input conspire to attenuate the signal. A preamp uses active electronics to deal with this impedance mismatch. The upshot of this is that any piezo pickup without a preamp between it and the amp will sound weak and tinny. Some piezo pickups also need a preamp to boost the level of their signal. In general transducers constructed using PZT material will have enough output so that they do not need additional gain from the preamp. But devices made of PVDF material have lower signal output and need additional gain from the preamp. Transducers made of PVDF piezo coax cable have particularly low signal output. The reason I’m bringing this up here is that not all piezo preamps are suitable for use with the transducer we just built– some can’t provide the additional gain. If you want to build your own preamp and have the skills and equipment to do so, figure 8 shows a simple circuit which works very well with this transducer. The transistor is a 2N4392, 2N4393, or something similar. To get more gain, decrease the value of R4. To reduce the gain, increase the value of R4. Mount the entire circuit in a fully shielded control cavity or shielded box. Trout Cove Lutherie is a great source for all materials needed to build this and other piezo transducers. They have thin microphone cable, all sorts of piezo materials, and can even custom build transducers to your specifications. They have no minimum order. If you need piezo materials in larger quantities, try Measurement Specialties Inc.
Stewart MacDonald is a good source for wide copper shielding tape with conductive adhesive. There are various sources of information on piezo materials on the web. The Measurement Specialties Inc. website (http://www.meas-spec.com) has a wealth of technical information. Also check out the site of Piezo Systems (http://www.piezo.com). The Trout Cove Lutherie site (http://www.tclutherie.hypermart.net) has much info on building piezo pickups for musical instruments, and has instructions for building a few different types of pickups. The Musical Instrument Makers’ Forum (http://www.mimf.com) is a good source of information on all aspects of lutherie, and its archives are known to contain a number of postings on piezo transducers and preamps. The Usenet newsgroup rec.music.makers.builders is another good source for info. If you are not usually set up to read newsgroups you can access this one from Google Groups. Finally, there are any number of websites featuring information on building piezo pickups, usually soundboard transducers. Searching the web for the terms “piezo” and “guitar” should get you a number of hits.